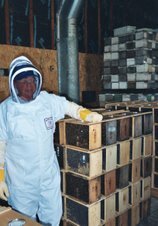 This year many beekeepers had over wintering success. Many colonies are packed with bees and are bringing in honey from the dandelion flow and the fruit bloom. Both of these events are about 3 weeks earlier than usual. As soon as these two events are over and the weather warms up, swarming will kick into high gear. Dividing strong colonies is the only way to prevent swarming. If you think the hives are full now, by mid May there won't be room in the hive for the bees. It will be hot in there from overcrowding and they will start hanging out on the front of the hive. Swarming hurts the bee population of a colony. When the bees swarm, most of the field bees and the queen leave the hive for new digs somewhere else. The loss of the field bees will affect the amount of honey collected this year by the colony. 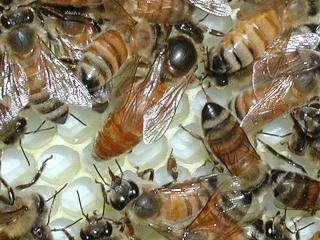 It may take a hive six weeks to two months to recover the population lost to swarming. Usually the main nectar flow is ebbing by this time. Missing the nectar flow, beekeepers may have to feed more for the hive to overwinter, to make up for honey uncollected by a weaker hive. There was a tee shirt around a while ago that read "United we swarm, Divided we thrive"
The simple saying, more bees means more honey. Less bees means less honey. Some beekeepers don't want anymore colonies. Nature's Nectar buys divides. Call me if you are interested. I am getting three shipments of queens in May. Queens will be available starting this Sat and continuing for the next three weeks to a month. I have a link in the lower right hand corner of this page of this blog taking you to a web page of how to do a divide. Gary explains it very plainly and easy to understand. The first load beekeepers should be looking for eggs in their colonies after one week, to make sure the queen has been accepted. No eggs means no queen. Queens will be available in all varieties on Sat April 28th. The Sunday bee pick up day went great. Most everyone got their bees and were on their way in very short order. The bees were in great condition. The weather couldn't have been better. Cool cloudy day made the day very nice for passing out bees. Monday I will be passing out bees for the rest of the beekeepers that couldn't make it. There will be no pick up schedule. The bees have arrived. Pick up today Sunday. Please try to follow the pick up schedule. There are many beekeepers picking up that day. If everyone sticks with the schedule the pick ups should move quickly with minimal waiting. There is no hurry to get them in. The best time to install package bees is after 6 pm. Check this blog daily for updates, the schedule can change. Please clean out all cages that will be returned. Remove and discard all feeder cans and queen cages. Remove all dead bees and debris. Drowning the queen with sugar water spray or forgetting to spray the queen and watch her fly away. This is not good. Before any queen maneuvers take place take a second and think before you act. If you have the plan down it should work. One quick spritz with the spray on her wings. I usually will wait until all her feet are at the bottom of the queen cage and I see the whole top of her, then a quick shppppt and her wings are wet. Hold the cage deep in the hive if doing the manual release. Using an entrance feeder to feed the colony. This can lead to starvation in short order. Use a pail feeder or cap and ladder feeder. I expect to have the bees sometime on Friday. They can be picked up on a first come first served basis. No pick up schedule on Friday. They are usually here in the morning. But nothing is for sure as of yet. Watch this blog. I will update when they are ready to be picked up. Please don't show up with out knowing they are here. I need the whole area to unload. The following is the pick up schedule for Saturday, April 14th. Please try to stay with the schedule. There are many beekeepers picking up that day. If everyone sticks with the schedule the pick ups should move quickly with minimal waiting. On bee day I will have 5 gallon pails of ProSweet Syrup, pre made pollen patties, feeder pails, and fumigillan for sale. This is a video I made last year. I have been doing it this way for many years and the method has worked for me. The one thing to always remember, the marshmallow release is only done with package bees. Requeening an established colony with a new queen must be done with a hard candy plug. Nature's Nectar LLC will be closed April 14th and 21st for the selling of bee supplies due to package bee arrivals. I talked to Ray my bee supplier this morning. Due to better than expected queen mating. The two deliveries are back on the original schedule. This can always change, so please pay close attention to this blog for updates. Many overwintered colonies are very strong. Queens are laying eggs full tilt. The early warm weather has put the bees about three weeks ahead of schedule. Pollen is coming in, but pollen patties are still being consumed. 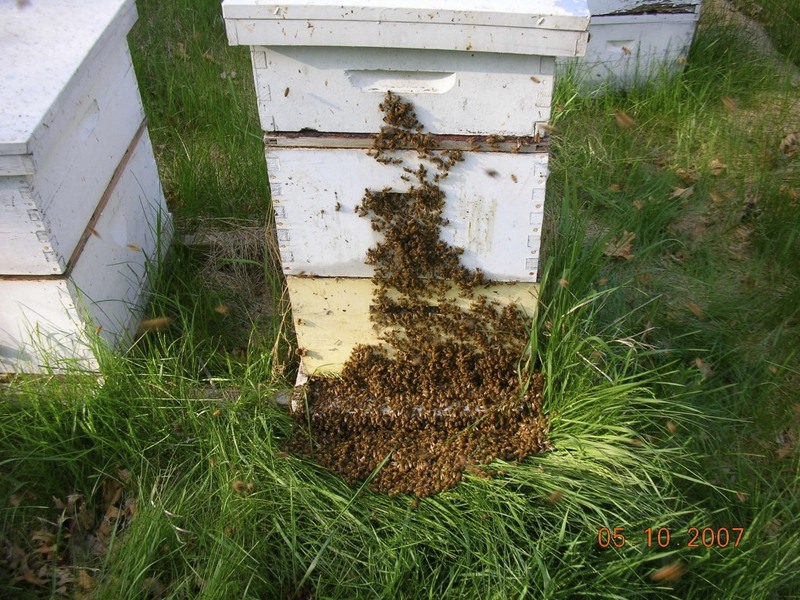 Most hives are ready for reversals if they haven't been done already. Top box to bottom, bottom to top. This will give the queen more room to lay and spread the brood and bees throughout the hive. It will also make the bees put pollen and any nectar coming in everywhere in the hive instead of in a concentrated area. Two deep colonies may be packed with bees and may be starting to think about swarming. Queens are very hard to get this time of year, so divides will maybe have to wait. Adding a third deep will buy some time with the added room. If the third box is foundation, it will be necessary to feed sugar water or ProSweet to get the bees to draw out wax cells. Remember, no feed means no wax. Being the bees started this build up early this year, any colonies not treated for mites last year should have their mite load checked. http://beelab.umn.edu/Resources/Free-bees/index.htm This is a link to the Univ of MN free bees. They demonstrate how to check the colony mite load. If there is a high mite load, treating with Hopguard or Mite Away Quick strips is probably the most natural treatments right now. They are both food additives and work well controlling Varroa mites. Api-Guard should not be used as that is a fall only treatment. Soon the dandelions will start coming out. The benefit of strong colonies will be dandelion honey collection. At the first sign of dandelions two supers should be added to a strong colony. Many overwintered colonies are still heavy with honey from last year, the bees will need a place to pack away the new incoming nectar.